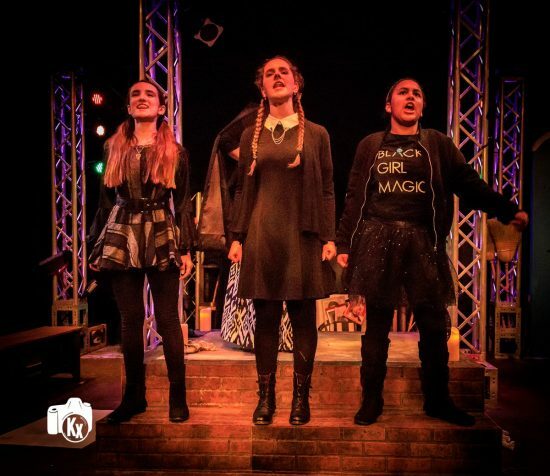 Sophia Manicone (Fiona), Samaria Dellorso (Mary) and Arianna Vargas (Marie) in ‘Witch.’ Photo by Kx photography. Creative Cauldron’s new musical, “Witch” certainly lives up to its billing as a bold new work, offering audiences an evening of memorable music, great acting, and moments of laugh-out-loud hilarity. Set at the Women’s March in Washington, D.C., three generations of women gather to protest women’s inequality with signs, bull horns, and the odd pointed witch’s hat. All are not in agreement, however, about how best to communicate their message, the younger generation bristling at their mother’s protest tactics, the grandmother of the group insisting on her own occasionally clashing vision for how to move forward. …an evening of memorable music, great acting, and moments of laugh-out-loud hilarity. In between protesting and arguing, the group travels back in time, conjuring the stories of women who, having been identified as witches, met their ends tied to a burning stake. This is not, sadly, a phenomenon found only in history books. Amidst the music and humor, the cast deftly addresses the seriousness of women’s second-class status: women are still being accused of witch craft today, and they are still losing their lives as a result. The set is simple, yet brilliant. Margie Jervis (scenic, prop, and puppet design) managed to assemble all of the elements of a good protest march, including a port-o-potty, into which the entire cast files after the final curtain call. A trio of musicians, Aleks Isotov (keyboard), Jimmy Cherry (guitar), and Jeffrey Thurston (violin), directed by Warren Freeman (music supervisor/orchestrations) brings the score to life, ably accompanying the singers, and occasionally pulling the audience’s heart strings when they least expect it. The creative team of Matt Conner (music and lyrics, co-director) and Stephen Gregory Smith (book and lyrics, co-director) have given the women’s movement a gift to enjoy for years to come, and perhaps even a measuring stick of sorts. With some luck, we might just find ourselves at a future production of “Witch” marveling that there ever was such a time, such a place, such a story. Running Time: Approximately 1 hour and 10 minutes with no intermission. “Witch” runs through May 6 at Creative Cauldron, 410 S Maple Avenue, Falls Church, VA 22046. For more information or to purchase tickets, click here.